A few things always jump out at me when I look at how a brand is communicating with its audience. It’s easy to get things wrong, but so important to get it right. Ok, so it may take a bit more than a handful of Ruby Slippers beans to come up with the magic. But clever ideas and a great execution will drive success, whether it’s online or offline communications. Our beans help us target and reach new audiences. It’s clever and creative, it helps us stand out. Have some fun and see what you can come up with… Oh and if you’d like some magic beans, I’d love to send you some. Get in touch. A little bit of creativity will help you stand out. There will no doubt be others doing what you do, so how are you going to get noticed? I say it’s the small but clever little touches that do the trick. If you’re struggling, gather together a group of (reasonably) well-functioning friends or colleagues and see if you can brainstorm some ideas to help pique your potential customers’ interest. 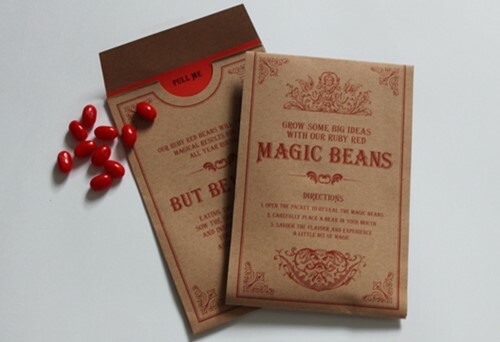 Sometimes an email doesn’t make the best introduction, so we ‘sow the seeds of creativity’ and send out a little packet of ‘magic beans’ to people we hope to impress, and more often than not we get a friendly response. Your brand is so much more than a company logo… and it’s really REALLY important to pay close attention to your brand. Of course, there’s the visual identity (a company logo, typeface, and a set of Pantone colours), along with the intangible aspects (the personality or tone of voice of the brand). But at the very heart of a brand is value (be it perceived or real). Value sits in the mind of the consumer; it encourages them to buy into your product or service above everybody else. It’s different for every business; a women-only gym will, of course, have a different, look, feel and values to a cancer charity for example. Spend a moment and get lost in the mindset of your customer; really consider your brand values and think about how these translate across every aspect of your business. These aspects are built up, over time, but key is the consistency of your brand communications – from your logo, typeface and colours, to the voice of your communications, both online and offline. It must all make sense to your customer and appeal directly to them. If you’re not sure, get a bit of help to get it right. Talk to your customers and share your business story. Some people are born great communicators, it comes naturally and they share automatically. However, not necessarily so for the more introverted amongst us. Think about the many MANY communications channels you have access to (both online and offline) and share appropriate information with your target audiences. This might include; successes and achievements, new developments, partnerships, events, new services, great images that capture your product or service… the list could go on. People like to hear good news stories. It shows your business is busy and focused on doing a great job. So telling your customers could be a very positive thing to do and it might just help with sales and cross-selling. Three little tips. All obvious stuff. Just a helpful reminder to keep an eye on your content & communications. with a little bit of magic.